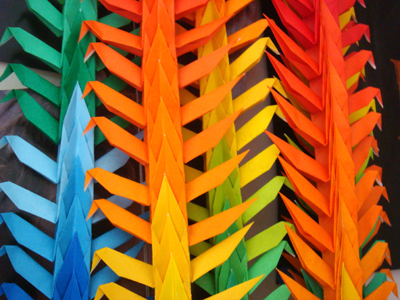 Something I really like to do is fold cranes. Sometimes I include them in notes to my friends, stick them round my computer moniter, or just keep them in a box. When I was in high school I found out that my Japanese friend was returning to Japan. 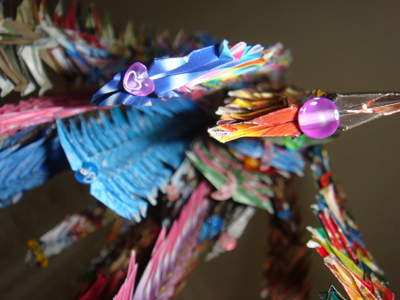 I decided to make her 1,000 cranes, because I’d heard somewhere that in Japanese culture if you make 1,000 cranes it’s sort of lucky, or at least a nice gesture. Luckily my best friend Mel said she’d help me, so we watched videos and folded them together. It was fun. 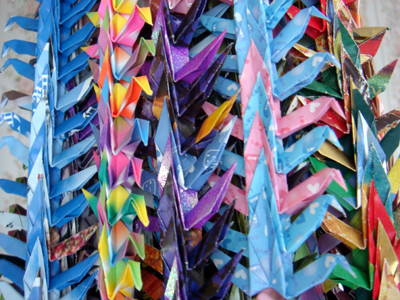 Since then I’ve heard the story of Sadako Sasaki and the 1,000 paper cranes, and heard that perhaps if you make 1,000 cranes the gods are impressed and so you earn a wish. So yeah, I guess you could say folding cranes is like a hobby of mine. I don’t do it that often, but it’s fun to just do while you’re watching TV or whatever. It’s kinda like reading – I’m not particularly good at it, or particularly fast, but if you keep plodding along you get there in the end. 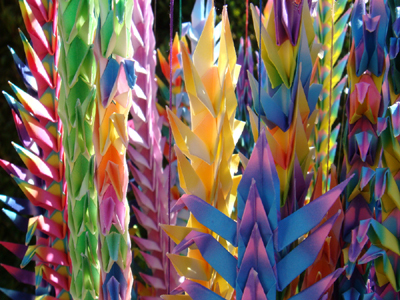 I believe that in Japanese, 1,000 cranes are a ‘senbazuru’. Here are some that I’ve created. 1. My first was for my Japanese friend, and… I don’t have any photos!! 2. My second was for Mel, the friend who helped me to make my first senbazuru. 3. My third senbazuru was made over Christmas while I was staying in Taiwan. 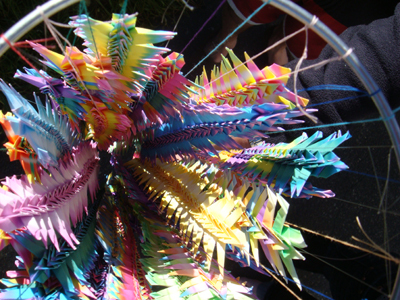 This set was for my mum and whenever I missed home (or there was anything good on TV) I would just fold cranes. I got to be a bit of a paper hoarder and would save advertisements, the wrapping paper from my Christmas presents, magazine pages, takeaway bags etc. for folding. To bring them home I used an original (soon to be patented 😛 ) technique involving a plastic ruler to get them into ‘Pringles’ tubes. I I could fit about 360 in each. 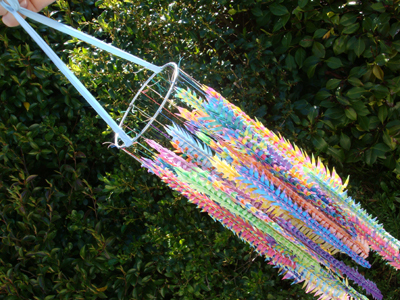 I think there are over 1,500 cranes in this one. 4. My lastest project (sort of) is to make a senbazuru for my Aunt. She has some health problems and although she’s a lovely, bubbly person she often feels exhausted. For this set I bought some special paper online from an Australian company selling Japanese Paper and Origami and Supplies. I’m so happy with the paper I got from them, It’s actually a kit so all the strings are going to match – gradiented colour from dark purple at the bottom to light pink at the top through bright blue, green, red etc. – 20 different shades in all! Pretty! The squares are also slightly larger than the ones I normally use and there are 40 cranes per string (1010 in all, I believe), to the whole thing will end up quite a bit bigger than my previous ones, I think. 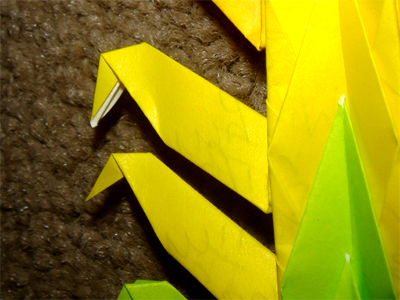 I’m also trying something else a bit special – writing on the back of each piece of paper before I fold the cranes. I’m mostly writing Bible verses, prayers, “inspiring” quotes, song lyrics, that sort of thing. I tried it once before with Mel’s set, but that was just odd cranes, not every single one. The paper for this set is quite cool because the colours are bright but the paper’s still thin which is good for folding and means you can see a little of the writing showing through. So that’s nice. I know no one will ever read what’s in them, but I feel that it’s nice to think of the good vibes and positive feelings coming from them.